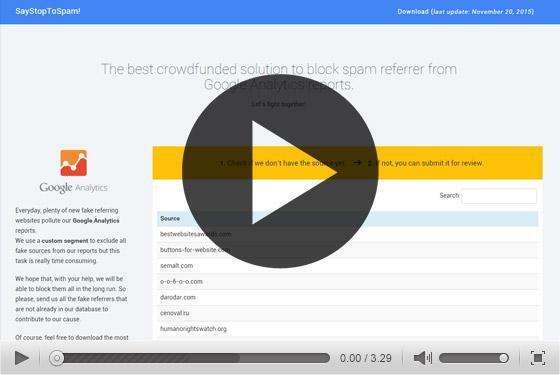 The best crowdfunded solution to block spam referrer from Google Analytics reports. Let’s fight together! Want to get rid of Ghost spam too? Everyday, plenty of new spam referring websites pollute our Google Analytics reports. We use a custom segment to exclude all spam sources from our reports but this task is really time consuming. We hope that, with your help, we will be able to block them all in the long run. So please, send us all the spam referrers that are not already in our database to contribute to our cause. Of course, feel free to download the most up to date Google Analytics Segment through the main menu of this page, even if you did not contribute. How to use this custom segment? – we added a filter to block the new language spam method. – thanks to you, we reached the 700 blocked spam referrers. Good job! – we created a guide to help you block ghost spam as well. – we added a code snippet for you to use on your website (check bellow). – you can now copy or download the list as csv. – we decided to use regex as we reached the maximum number of filters you can set in a segment. – we added localhost in the list of spam referrers with few others as we don’t it to pollute the reports. – we changed the segment name to include the number of sources. This way, you can be sure to have the last version. – we decided to block all the sessions when the language is (not set). 1. Check if we don’t have the source yet. ➜ 2. If not, you can submit it for review.